Are Kids Spending Too Much Time on Their Mobile Devices? • The average number of minutes played per session peaked in the tween years, falling through the teen and early adult years. 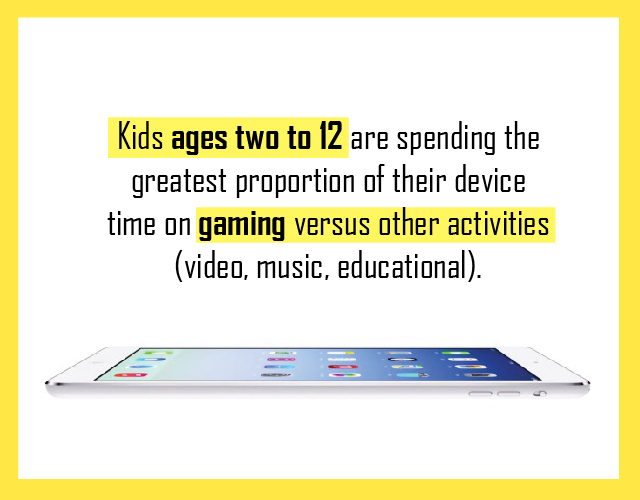 • Kids ages two to 12 are spending the greatest proportion of their device time on gaming versus other activities (video, music, educational). • This age group is also playing (an average of five) more games and paying for more games (an average of three). The findings in this report support our assertions that 1) the time spent on a mobile device should be closely monitored and 2) the activity being experienced on the device should be monitored as well. Because a mobile device has an abundance of activities, it’s important to demonstrate to children how to manage their time on a device. This is especially true with very young children who often lack impulse control. Games are very addictive and can be overused with little effort. It’s up to the parents to effectively manage a child’s device time as well as what they utilized when on the device. We are makers of educational software for children and we encourage parents to make time for fun educational apps, e.g., games and storytelling apps. Perhaps, a minimum of 15 minutes per day, free from gaming or any other activities will do just fine.